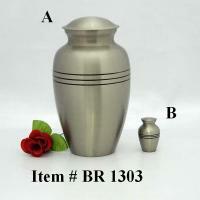 We bring froth an exclusive range of Brass Cremation Urns in the market. 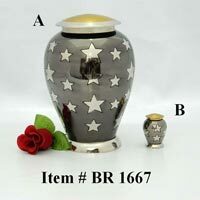 Our range of Brass Cremation Urns is beautifully crafted in elegant designs and patterns. They are available in the sizes of 26.5 cm x 16 cm x 16 cm and 24.5 cm x 17 cm x 17 cm with the weight of 2.1 Kg. They have pewter finish and Nickel finish.